The LLTM30-B is the perfect solution to charging and securing up to 30 tablets (sold separately). 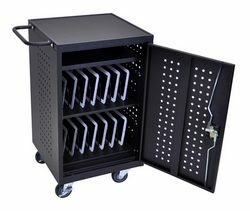 Use this mobile & lockable laptop chaging cabinet to securily store and charge up to 30 laptops or tablets. Please click on the video clip below to see both systems. Select your locking option using the drop-down menu above the Buy Now button.